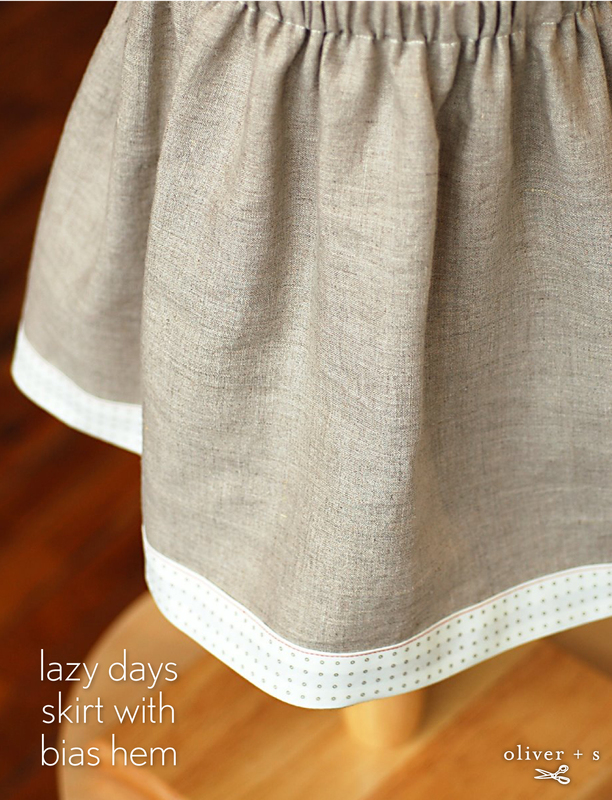 We continue to be amazed at the popularity of the Lazy Days Skirt pattern. If you take a look at the Flickr group you’ll see a large number of skirts made from this simple, free pattern. I’m sure we’ll be seeing many more of these appearing there in coming weeks with the warm weather that is arriving in the northern hemisphere. We made this linen skirt the other day to show you that you can also use bias-cut fabric strips in place of the ribbon hem on the skirt, much in the same way our hem facing is done–but reversed so it shows on the outside of the skirt, instead of discretely finishing the inside of a dress. As you can see, the finished skirt is getting lots of wear. The wearer, however, is not practicing the name of the skirt. She just keeps going! And going. And going. Here’s to a relaxed and enjoyable summer ahead. I love it! I love the way the fabric rumples after “the wearer” has played in it! That’s great! I’m liking this skirt even more! This is darling. 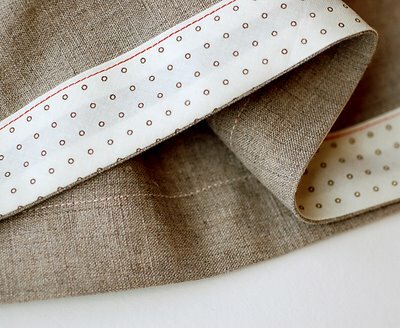 I have some linen set aside for one of these–I’ve been wondering, when you make this out of fabric that is 60 inches wide, do you use the full width? I dare say I’m going to try to make one for myself today! Perfect summer “mom” uniform with a t-shirt and sandals! I just made two of these skirts for my twins and they are adorable and EASY. Thanks!! Thanks for the pattern. My only trouble is that the elastic keeps folding over on itself in the casing. Maybe a more narrow elastic or a wider casing would help? Or maybe it’s just too much fabric to gather up around my daughter’s small waist (18in)? Hi… I am new to sewing and am wondering what how much fabric to use for the lazy days skirt? I am not familiar with what selvedge edge to selvedge edge is. Could someone let me know how much fabric to cut? 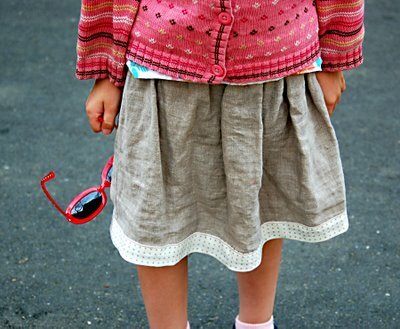 I have a 6, 9 and 11 year old who all want this skirt. Thank you so much for the pattern. Can’t wait to try it out on my 4 year old granddaughter!